Ten gigabits per second is followed by 25 and 40 gigabits per second. These are the next milestones on the Ethernet roadmap for copper cabling. The new standards are: Cat. 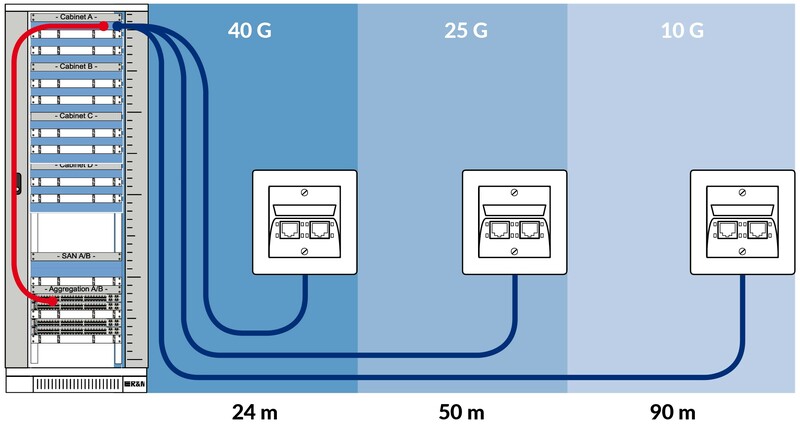 8.1, 25GBase-T and 40GBase-T. Whoever is planning LAN cabling to be used long term should certainly take these into consideration and choose only appropriate components. The transmission performance in the twisted-pair copper cable is increasing from 10 to 25 and 40 Gigabit/s, the transmission frequency up to 2000 MHz. The standardization committees have basically agreed on this quantum leap. The links will have to be shortened, however, to be able to handle attenuation losses and crosstalk. With 40GBase-T the distance is to be 24 m. With 25GBase-T, latest findings would suggest that a distance of 50 m may well be feasible. For 10GBase-T the distance remains at 90 m.
What is important now is for planners, users and decision makers to be forward-looking and take the shorter distances and new options into consideration. Experience shows that anybody investing in a LAN today is going to want to use the cabling for more than 15 years. People are looking for a guaranteed future and investment security. To date mainly applications in the data center area have been taken into consideration for 40GBase-T. 25GBase-T could well be of interest for the LAN sector. Possible applications for 25 Gbit/s in structured office and building cabling are already becoming apparent. For example, WLAN access points of coming generations will require bandwidths higher than 10 Gbit/s. 25GBase-T would make this long awaited evolutionary advance possible. With a range of 50 m, 25GBase-T could cover two-thirds of all typical link lengths in local data networks. This in turn also puts the spotlight on the use of Cat. 8.1 systems in LAN planning. A Cat. 8.1 installation would result in a LAN design with length-dependent transmission speed. Well-thought-out utilization planning can cover the most challenging of transmission requirements. An important point is component selection. We recommend choosing Cat. 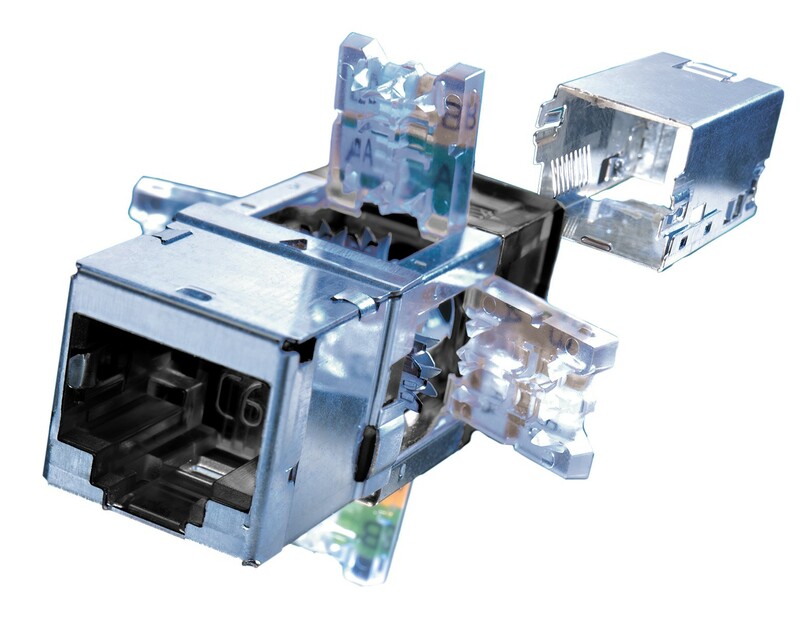 8.1 systems with the tried and tested RJ45 format. The alternative Cat. 8.2 connector systems are not any more advantageous in terms of transmission speed and require comparatively expensive, cumbersome adapter cables. When evaluating products, planners should make sure that Cat. 8.1 components are backward-compatible. If, for example, the user wants to continue using Cat. 6A patch cords, at least one 10GBase-T transmission should be possible. Warning! This is not the case with some products. A further recommendation: Two measurements for formal acceptance should take place after installation, one for Cat. 8.1 and one for Cat. 6A. R&M is on the front line for this quantum leap in copper cabling. The R&M lab in Wetzikon is developing innovative Cat. 8.1 products for LAN cabling. They will be 100% backward-compatible and offer unbeatable performance.